Below is a summary analysis of the Open APIs 2.0 session at the May 2009 Telco 2.0 Executive Brainstorm which, for the first time gathered together leaders of the major telco API programmes - GSMA, TM Forum, MEF Smart Pipes, OMTP BONDI, Orange Partners, Alcatel-Lucent - and some of their potential users (BBC, Yahoo, Amazon etc). Platform-based 2-sided business models need APIs to enable upstream customers to use telco assets and processes. There are a huge variety of APIs and enablers being developed in the market by industry bodies (GSMA, TM Forum, OMTP, MEF), by individual operators (Vodafone Betavine, Orange Partner, O2 Litmus), and by ad hoc consortia (such as Vodafone, China Mobile, and Softbank’s JIL). But what is the commercial strategy that underpins these programmes? What needs to be done to ensure that APIs are valuable for upstream customers (developers, merchants, advertisers, and government) and profitable for operators? Participants were asked near the end of the panel: Which of the following statements best reflects your views on the API efforts of the Telco industry? Individual operators and cross-industry bodies are getting things about right and current API programmes will yield significant value to the Telco industry in the next 3 - 5 years. 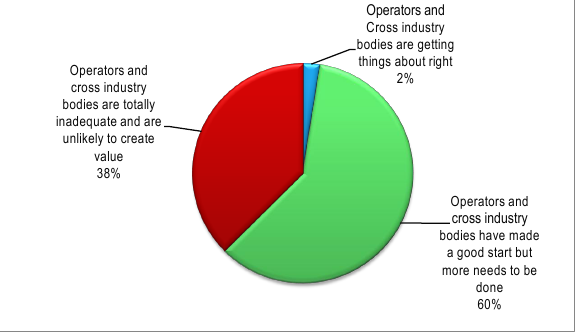 Individual operators and cross industry bodies have made a good start with their developer and API programmes but more needs to be done to standardise approaches and to bring commercial thinking to the fore if APIs are going to generate significant value to the Telco industry in the next 3 - 5 years. The current developer and API activity by individual operators and cross industry bodies are totally inadequate and are unlikely to create value in the next 3 - 5 years. There is a real risk of this API activity being derailed by the emergence of numerous independent “islands” of APIs and developer programmes. It is not uncommon for operators to have 3 or more separate initiatives around “openness” - in the network, on handsets or on home fixed-broadband devices, in the billing system and so on. Various industry bodies have taken prominent roles, usually at the level of setting requirements, rather than developing detailed standards. Large-scale one-off projects and collaborations, which may require custom or bespoke capabilities (e.g. linked to subscriber data management systems or “semi-closed” / “private” APIs), for example with governments or major media companies. It seems that certain sets of APIs are quite standalone and perhaps have simpler monetisation models - e.g. location lookups or well-defined authentication tasks. Others, such as granting 3rd-party access to specific “cuts” of subscriber data, may be more difficult to automate. The fireworks between various panellists also illustrated an important point - there remains considerable tension between those advocating business models which are ‘content’-driven, involving the delivery of packaged entertainment and information to consumers and enterprise customers, versus those which are aimed at facilitating large numbers of new and (mostly) unknown developers who may use the platform to create ‘the next big thing’. Both business models have merit - while there is certainly value in using packaged approaches like “sender-pays data” for well-defined content types, there is also huge potential in becoming the platform of choice for unexpected ‘viral’ web applications that exploit unique Telco assets. Consider “eating your own dogfood” and use elements of third-party web services and APIs as part of your own offering, at least in the early stages. In particular, this could reduce time-to-market and enhance flexibility. Event Participants: can access the full presentation transcripts, delegate feedback, and long-term recommendations for action at the event download page (NB. the URL has been emailed to you directly as part of your package). Executive Briefing Service Members: can do so in a special Executive Briefing here. Non-Members: see here to subscribe. API's (open or otherwise) are clearly an interesting and hot topic for the Mobile Industry. Apologies for the shameless plug, but I believe its a interesting topic to debate.